Synopsis: Henry Page has never been in love. He fancies himself a hopeless romantic, but the slo-mo, heart palpitating, can’t-eat-can’t-sleep kind of love that he’s been hoping for just hasn’t been in the cards for him—at least not yet. Instead, he’s been happy to focus on his grades, on getting into a semi-decent college and finally becoming editor of his school newspaper. Then Grace Town walks into his first period class on the third Tuesday of senior year and he knows everything’s about to change. 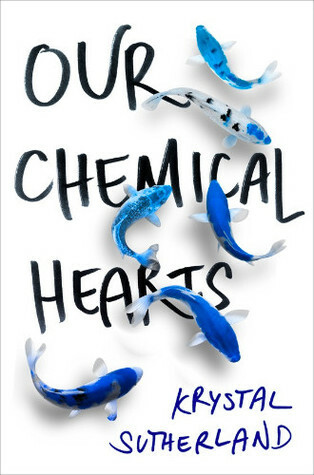 This week I am waiting on Our Chemical Hearts by Krystal Sutherland. The publicists as YALC pitched this book to me as another lovechild of John Green meets Rainbow Rowell contemporary. Those are big shoes to fill, but it left me intrigued since those are two of my favorite contemporary authors. The reviews for Our Chemical Hearts have been amazing so far. I’m really looking forward to meeting these characters and reading their story. I’m wary of fix-it romance type books, which I can’t tell if this is or not, but I hope you enjoy it! I do like the cover. My sister-in-law featured this one on her blog last week. It looks good. Hope you enjoy it! This is a popular one. Looks good. Enjoy!